Ozeki VoIP SIP SDK makes it easy to build your predictive dialer system. This article will guide you through the terms and main concepts of predictive dialers, then you can use the codes and explanations to start development. When an autodialer connects an answered call to a live agent, it is often called a "predictive dialer". A predictive dialer uses realtime analysis to determine the optimal time to dial more numbers, whereas a power dialer simply dials a pre-set number of lines when an agent finishes the previous call. In case of call center systems the communication can be started from inside or outside the system. When an outside communication request is received it usually means that a customer calls the call center for some reason. However, there is also a possibility to start calls from inside the call center, for example in case of a callback request. When a call center agent performs a callback towards a customer, the calling process also goes through the call center server, therefore there is the possibility to implement some checking processes on the server-side. 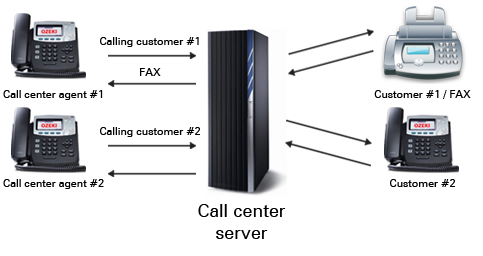 These processes can be used for detecting the fact that the called customer's line is engaged or that a fax machine answered the call. Call answering can be analyzed by a voice recognition system that should be able to differentiate the fax machine, a busy signal or the actual human voice. The call will be literally established between the agent and the customer only if a human voice answers the phone call. In the following section you will learn how you can extend your Ozeki VoIP SIP softphone application with the support for predictive dialing. For this purpose, you will need to download and install Ozeki VoIP SIP SDK first. You can find a detailed step-by-step guide with an example about developing Predictive dialer at the Predictive Autodialer article.